Guess what’s happening on January 1, 2019, at exactly 12:33 am EST (give or take one minute)? Okay, here’s the answer: New Horizons will fly by Kuiper Belt object 2014 MU69, also known as Ultima Thule. You didn’t know about that? What kind of science nut are you!? I’m just kidding, of course. I understand that not everyone thinks space, and space probes, and Kuiper Belt objects are exciting. But I’m here to tell you that they are exciting! Here are four reasons that you should pay attention to New Horizons. For what it’s done in the past and what it will do. The future is bright for the little space probe that could. It took this little guy almost 10 years to reach Pluto. But that’s crazy fast considering the amount of mileage (or kilometerage, whatever you like), it put on while getting there. Pluto is over 3 Billion miles away from us. That’s a serious trek. New Horizons is moving fast. In fact, it’s the fastest launching spacecraft ever. It’s going about 36,000 miles per hour. That’s almost 1 million miles every day! Plus, this piano shaped spacecraft has all kinds of cool instruments on board. There’s Ralph, which is an infrared spectrometer that provides color and thermal maps. Alice is an ultraviolet spectrometer that’s an expert at analyzing the makeup of atmospheres. REX is a radio experiment that measures atmospheric temperatures. LORRI is a telescopic camera, the best at taking long range pics. The SWAP is all about measuring the solar wind way out there in space. PEPSSI is a particle spectrometer measuring ions escaping from Pluto and any other object the probe passes. There’s even a little device built and operated by students. It analyzes dust and how it affects the space probe. Like I said, this little guy is cool. Pluto is a big enough reason for you to care about New Horizons all on its own. Since its discovery in 1930, people have wondered what the little planet way out in the boonies looked like. Of course, it was eventually knocked out of the planet group and classified as a dwarf planet instead. Is dwarf planet the PC term? But you might be asking since Pluto is so close, why can’t we point our big telescopes at it and snap a picture? We take pictures of galaxies far, far away all the time. Pluto may be closer than a galaxy far, far away, but it’s much smaller. And dimmer. And since it’s a little brown lump in the middle of a vast, endless vacuum, it can’t be pictured from here. Enter New Horizons. This fast spacecraft managed to reach Pluto in an unprecedented amount of time, just 9.5 years. And when it did, the wait was well worth it. What did it discover on Pluto? A complex world that nobody dreamed existed that far away from the Sun. Pluto and its moons are a complicated system. 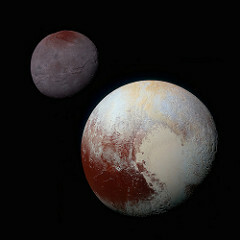 Pluto and Charon, its largest moon, have a strange gravitational bond where the two actually orbit around a fixed point in space instead of one orbiting around the other. Charon might have a subsurface liquid ocean and for the first time, we saw its red polar ice cap. 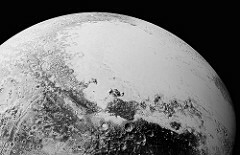 Pluto greeted us with a huge, heart-shaped surface feature. It has mountains, valleys, and a relatively new surface, indicating volcanic activity. It’s also got an atmosphere… who knew!? Ultima Thule will be really cool. I know, it sounds like the villain in the next Avengers movie. But New Horizons will fly by it on New Year’s Day and I couldn’t be more excited. Like most of the icy, dust lumps floating around out in the Kuiper Belt, we know little about Ultima Thule. The spacecraft managed to capture its first picture of the little world a few days ago. And although the pictures aren’t outstanding (it’s still more than 100 million miles away), the scientists are excited that it’s right where it should be. After all, it’s not easy to pinpoint an object that small with a spacecraft that’s even smaller. It’s expected that Ultima is just a few kilometers in diameter and may be a binary system. Meaning it’s two dusty rocky things floating around together. It will be the furthest and least-known object ever visited. Who knows? Maybe it really is the next Avengers character, lying in wait for the little spacecraft to come discover it. New Horizons after Ultima Thule. Most exciting of all is what’s yet to come. After the flyby of Ultima Thule, we’ll have a lot more knowledge about the Kuiper Belt and its elusive objects. With all that cool tech on board, we’ll know about its atmosphere, chemical makeup, gravitational properties, interaction with the solar wind, and thermal maps. And we’ll have some spectacular pictures! 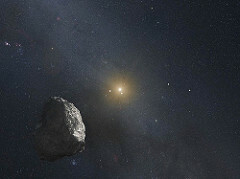 Odds are good that if this flyby goes well, another will be in the future for New Horizons. With the speed it’s carrying, it could reach another object within a few years. And it’s going to tell us more than we ever knew about the edge of our solar system. Now I ask you, how can you not pay attention to that? If you haven’t yet, please follow me on Instagram! I’ve also got a new Facebook page where I’m sharing with you all that I love about space, space travel, space adventures, space fiction, space dancing, space mania! 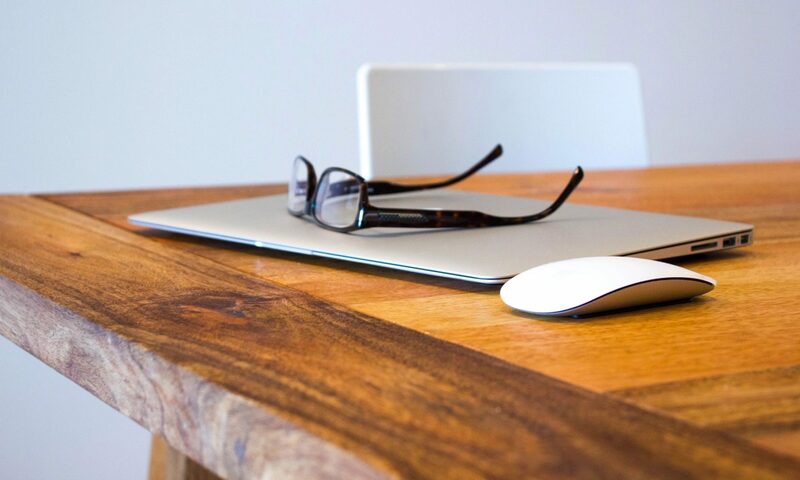 Want to know about a certain topic? Drop a comment below and I’ll write a blog about it!